When the news first broke last April that Detroit Tigers outfielder Delmon Young had been arrested in New York City for making an anti-Jewish slur following a night of drinking, I wrote about my disappointment in him on this blog. I explained that, after hearing this news, it would be difficult for me to cheer for him even though he would continue to play for my beloved, hometown Detroit Tigers. In an op-ed for the Huffington Post, I wrote, "My oldest son is 8. In the past year he has become a die-hard Detroit Tigers fan... How am I supposed to explain to my son that Delmon Young was drunk, got into a street fight, yelled an anti-Semitic slur and got arrested?" After reading my words in the Huffington Post, Delmon Young's agent Joel Wolfe sent me an email explaining that "Del is a special kid, and nothing like the animal that the NY media portrayed him to be." About a month later I was at the same dinner as Delmon's other agent, Arn Tellem of Wasserman Media Group. We spoke for a while about Delmon, and again I was told that he's a special kid who just needs the right mentoring to stay on the path to success. I took those words to heart and decided to try and give Delmon the benefit of the doubt for the rest of the season, but it wasn't easy. Whenever he came up to bat I felt a little uneasy and would picture the scene on the sidewalk in front of his NYC hotel. I didn't really think he was an anti-Semite and I wanted to just forget about the whole incident, but it was difficult. Everyone in Detroit knew that Delmon would be released by the Tigers organization at the end of the season, regardless of his postseason performance. That would prove to be accurate. 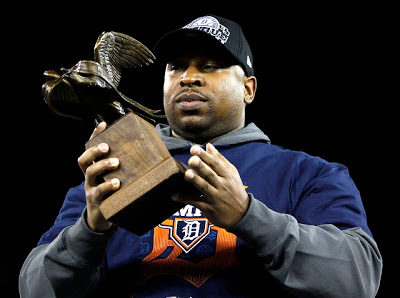 Even though Delmon, as the designated hitter, batted better than his teammates in the American League Championship Series against the Yankees and won the ALCS MVP award (he was called a "class act" during the award presentation by Jackie Autry), he was still sent packing. I was happy to see him go, but I was also ready to forgive. In Judaism, we prioritize the concept of teshuva -- repentance. Delmon Young made a costly mistake back in April, but he is not an avowed anti-Semite. He was drinking too much and let his emotions get the better of him. At the end of the day, I'm sure he's the good kid that his agents (both Jewish) say he is. And now, he's found a new home with the Philadelphia Phillies and I wish him well (unless the Tigers are facing the Phillies in the World Series of course!). Delmon's ultimate punishment was not the suspension or the ten days of community service he was forced to perform, but the permanent reminder of the incident. Like Jean Valjean, the protagonist of Victor Hugo's Les Misérables, Delmon Young will carry a negative label with him for the rest of his career and likely for the rest of his life. His signing with the Phillies this week was proof of that. The acquisition of a player like Delmon Young should have warranted a mere mention in sports articles about recent off-season transactions, not entire commentaries. "I certainly feel comfortable with the due diligence we put together. But it's really up to Delmon to prove us right. I'm part Jewish, so it's a concern to me,'' said Amaro, whose mother is Jewish. So, in recognition of the importance of repentance and judging others with the benefit of the doubt, I wish Delmon Young the best in Philadelphia. I don't suspect he will find himself getting in trouble again since I wholeheartedly believe he learned his lesson well. I have my doubts about how well he'll perform in right-field for the Phillies (his defensive skills were inadequate in Detroit), but I think he will mature into the good person that those close to him say he is. And while the Detroit chapter of the Delmon Young saga is now closed, I will continue to follow his career and pray that he does whatever he needs to do in order to stay on the right moral path during his playing years and beyond. Good luck Delmon!